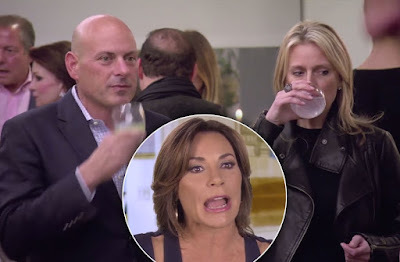 iRealHousewives | The 411 On American + International Real Housewives: Tom D’Agostino Is Not Dating Ex-Girlfriend Missy After Split From Luann de Lesseps, Says Sources! Tom D’Agostino Is Not Dating Ex-Girlfriend Missy After Split From Luann de Lesseps, Says Sources! Despite rumors that Real Housewives of New York City star Luann de Lesseps‘ estranged husband Tom D’Agostino is seeing an ex-girlfriend just less than a month after announcing their divorce, an insider reveals that’s not the case. As previously reported, D'Agostino was spotted with ex Missy Tool, the same woman who made cameo appearances during Season 9 of the Bravo hit reality series. But according to sources, the two are "just friends." D’Agostino and de Lesseps tied the knot Dec. 31 in a lavish Palm Beach ceremony after a whirlwind courtship. As seen on RHONY, friends warned the former Countess that D'Agostino wasn’t ready to commit. If you recall, he was photographed kissing another woman at New York’s Regency Hotel the day before their engagement party, which was a hot topic last season of RHONY. Even after the wedding, signs pointed to trouble: During the season finale, businessman D’Agostino joked to Tool that he felt like a “dog with a collar” before removing his microphone. The couple announced Aug. 3 that they’re divorcing. “We care for each other very much, hope you respect our privacy during this sad time!” de Lesseps tweeted. The reality star will open up about their marital troubles in a sit-down with Andy Cohen on a WWHL special episode, which will air on Wednesday, September 6. Labels: LuAnn de Lesseps , Luann de Lesseps And Thomas D'Agostino's Divorce , Missy Tool , Real Housewives Gossip , Real Housewives of New York City , RHONY , RHONY Season 9 , Thomas D'Agostino Jr.